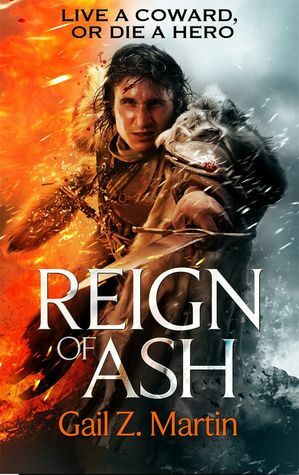 Gail Z. Martin continues her ‘Ascendant Kingdoms’ series with this second book: Reign of Ash. In my review of the fist book I wrote: “These aren’t intelligent savages hacking and slashing their way through the world, these are civilized men and women in a world of war, agriculture, and magic.” It was this aspect of this epic fantasy that set it apart for me from all the other epic fantasies that are out there. But with Reign of Ash, we’ve fallen back to relying on the usual fantasy tropes and constant battle sequences or at least preparations for battle. I also previously wrote that I wasn’t sure how I felt about having vampires included in this sort of fantasy. Here, I actually liked it. Perhaps this is because they were now established in this world whereas they took me by surprise in the first book. But then… are vampires a feared enemy? Is the fact that both sides in the battles have a vampire a form of ‘equal power’? The vampires (Penhallow with our hero, Blaine, and Reese with the cruel Lord Pollard). Both vampires seem mighty powerful, but neither really does much other than frighten people with their presence. Our hero, Blaine McFadden, recognizes that he is probably the only one who can save and restore the magic that has kept his community alive. So, even though they had banished him in the previous book, he’s off to set things ‘right.’ There are, of course, those trying to stop him (Pollard, mentioned above) and he brings on a few friends to help him in his quest. And of course, because this is an epic fantasy, it’s not so simple as o in, fight, win. There are a series of quests/tasks that must be performed. And a lot of wandering through open, desert countryside, where it’s hard to hide from enemy forces. But just when things seem bleakest, a friend happens along to help Blaine out. This was one of my complaints about the first book … Blaine’s charmed life. He never really has to work too hard, himself, at anything. There’s even a whole covey of vampires that come to help him at one point. And because of this…I got bored. This is a lot of book to be going from one mini-crises to another only to be saved at the last moment each time, but deus ex machina. Most of the supplementary characters only appear when necessary – not always present – and so it’s easy to lose track of them. More than once I’d stop to think, “Now who was that?” And the same goes for the locations. Where are they now? Where is this in relation to that? I’ve come to realize that I’m not a big fan of the epic fantasy story, though there have been exceptions. Martin’s writing style is very readable and enjoyable, but the plotting and over-population of characters who don’t really matter, made this a tedious read. Looking for a good book? Reign of Ash by Gail Z. Martin is the second book in an epic fantasy series, that could have been half the length and told the same story without losing anything meaningful.